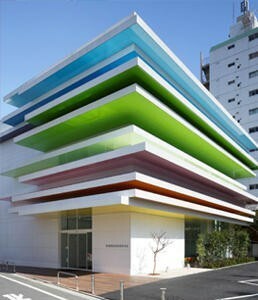 Horizontal layers of colour protrude from the facade of this bank in Tokyo designed by Tokyo-based French architect Emmanuelle Moureaux.Having completed the design for branch outlets of Sugamo Shinkin Bank, Emmanuelle Moureaux was also commissioned to handle the architectural and interior design for its newly rebuilt branch in Shimura. For this project, Moureaux sought to create a refreshing atmosphere with a palpable sense of nature based on an open sky motif.A rainbow-like stack of coloured layers peeks out from the façade to welcome visitors.Reflected onto the white surfaces these colours leave a faint trace over it, creating a warm, gentle feeling. At night, the coloured layers are faintly illuminated. The illumination varies according to the season and time of day, conjuring up myriad landscapes. The ceiling is adorned with dandelion puff motifs that seem to float and drift through the air. In Europe, there is a long and cherished custom of blowing on one of these fuzzy balls while secretly making a wish. Bits of fluffy down gently dance and frolic in the air…carried by the wind. All walls are covered with a special layer of PVC and the flooring is finished through a selection of vinyl tiles.